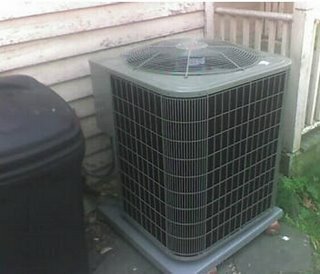 Yonked :: Diary of a New Home: Houston... we have air conditioning! Yesterday the hvac guy and the electrician (both named Dave) came by and after a bit of good-natured jocularity got to work. There was some minor problems with our electrical board (including the stunning announcement that our Dominican electrician Willie did not necessarily follow standard procedures, and used cheaper breakers than the current electrician would have preferred) But Electric Dave figured stuff out, moved some of the breakers around, and most importantly got it done. Electric out to the other side of the house, breaker installed, all complete. We've got to call ConEd about something else, and then probably have Dave come out to bid the one or two electric projects that we have left (and also the largest one-- bringing electricity to the garage!) He's expensive, but I feel pretty confident he's going to do the job correctly. Meanwhile, Cooling Dave was manhandling our new Condenser unit into place. It turns out that the bigger the box, the more energy efficient it is. So we have a large ugly futuristic box outside our house-- a box that is nearly empty, waterproof, and contains a large fan that mysteriously creates cool air. An interesting thing about it is that they no longer provide covers for these bad boys-- it turns out they don't really need covers, but they were provided for aesthetic reasons. But people were always running them with the covers on, and the company was going bankrupt covering the warranty on them. So they stopped selling covers. Anyway, after that (or really, before that) was the drilling into the house, which it turns out is not so easy, thanks to those 1895 standards and practices. The foundation is pretty thick and not easily penetrated. But modern tools won out, and the condensing pipes and wires were all laid out properly. Tom, Dave's partner came by today and fixed it all, installing the relay, and making sure that everything works. And now-- voila! Air conditioning! Anybody that had thought about donating to our air conditioning fund-- now is the time to do it. Send checks, cash, paypal, or large boxes of macaroni. And those that would like can come bask in our air conditioned splendor. Comments on "Houston... we have air conditioning!"